A bath can make or break a luxury home, and nothing else spells luxury and decadence in a bathroom like a truly lavish tub. Come to think of it, there is no rule whatsoever that bath tubs should only be white or look like clones of each other, right? So you’re perfectly in the right if you feel that making your bathtub the standout feature in your bathroom is a great idea. With the above said, what to go for? Is marble better than glass? Will wood be as amazing as metal? Will any of those materials be functional as well as a joy to look at? The last thing you want is having to replace a beautiful tub because it wasn’t as real-world friendly as you thought it would be, right? Fret not! We’ve compiled 8 beautifully different bathtub materials that would be an incredible addition to your bathroom no matter what is your aesthetic or design style. Believe it or not, a tub made from a barrel or made to look like a barrel is more comfortable than it looks. It is unmistakably luxe while retaining a rugged edge that would be great for a luxury cabin or a bachelor’s pad. Concrete can be luxurious if used right. It will also allow you to have a sunken tub that you may simply tile for comfort and aesthetics. Not only will using concrete save you from the technicalities of installing a tub but can give your bath a built-in look and feel. Can be customised to almost any specification as well! Copper has been making a huge comeback in the last decade because of its beauty and durability. There’s something about copper’s subtle dark sheen that looks deliciously rich and alluring, more so when used in a more natural setting. Glass can be surprisingly sturdy as a tub and completely waterproof. It can be installed clear, frosted, tinted, and look amazing with almost anything. 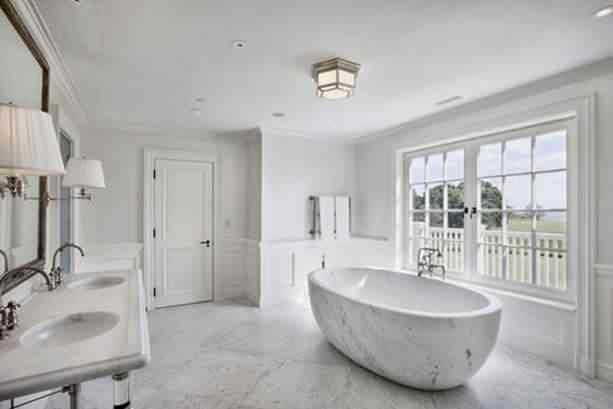 Feel like an emperor with a lavish freestanding marble tub crafted from a single piece of marble. The fully customised tub has an old world charm while exuding a distinctly modern feel. It is basically timeless too. Do you know that you can carve out a boulder to produce a unique earthy bathtub that’s distinctly you? If cost or logistics is an issue, you can achieve the same rock tub by getting an acrylic version. A stainless steel tub is far from ugly when done right. It can be made to look industrial or look sophisticated depending on the tub’s shape and the design of the space it is installed in. The best part is the fuss-free maintenance aside from the fool-proof durability. Waterproofed marine wood makes for a rich and exquisitely beautiful bathtub that’s a joy to take a take a bath in. Wood tubs goes well with both stone and tiles plus can be stained to fit a room’s design. Interested in investing in luxury real estate in Oakville with the best bath that you can find? Start your search in our listings of Oakville luxury homes. Don’t forget to contact us so we can make sure that you get a priority view for new listings!